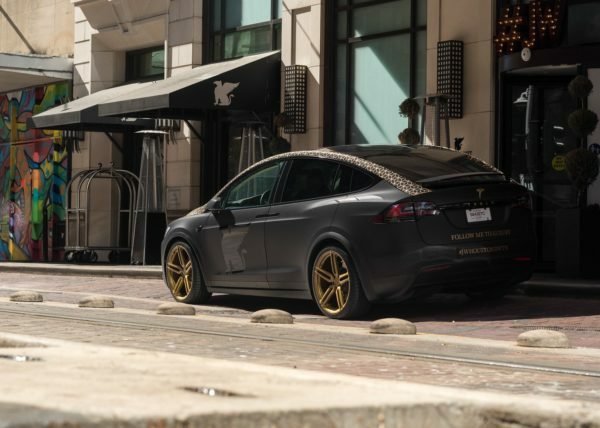 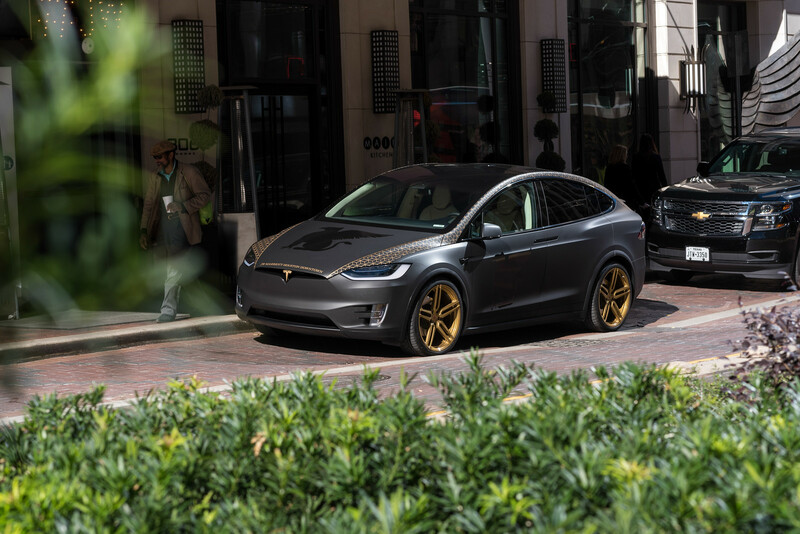 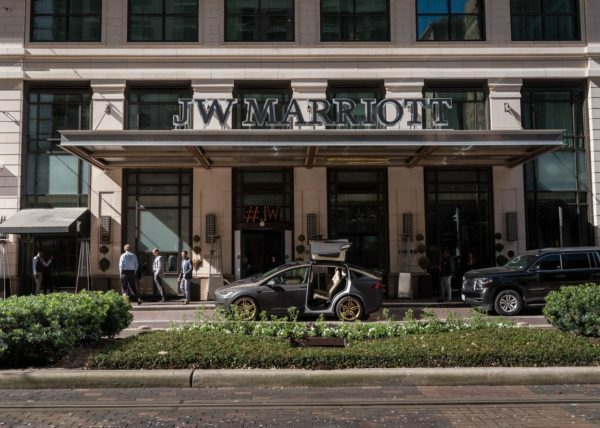 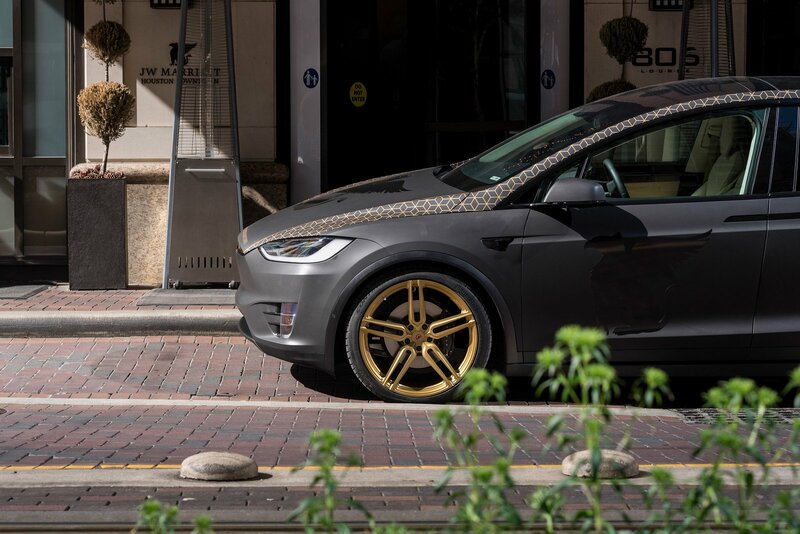 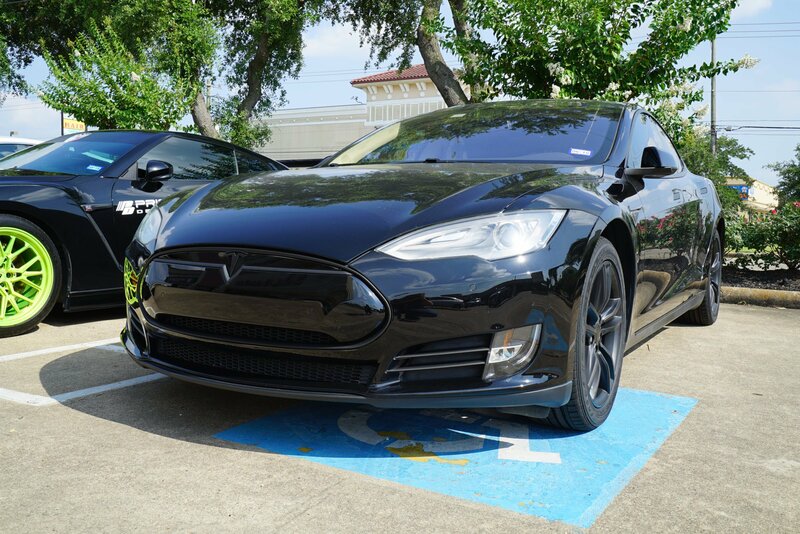 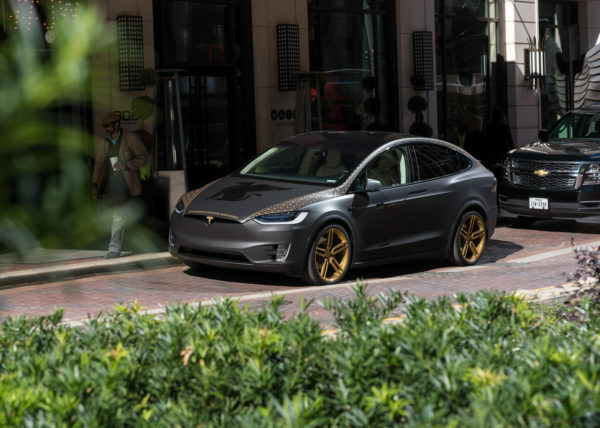 Tesla - Vinyl Wrap Films / Chrome Deletion - EVS Motors Inc.
EVS Motors teamed up with JW Marriott to customize their Tesla Model X shuttle vehicle. 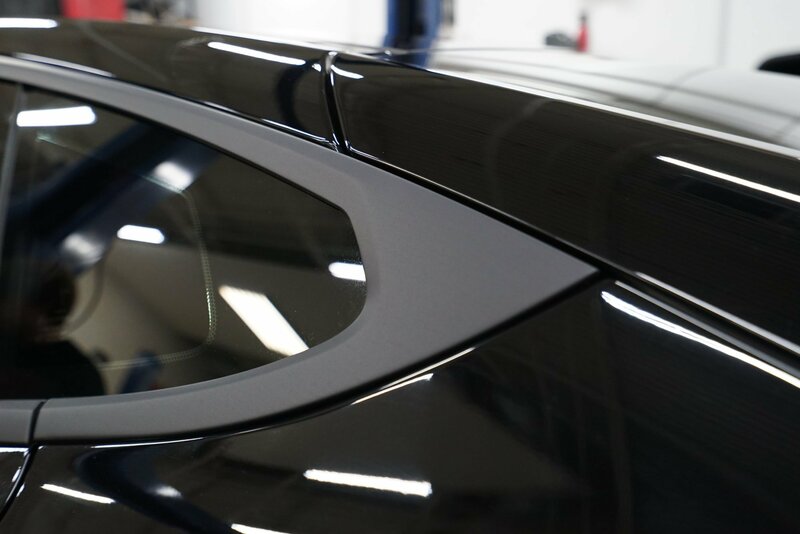 Complete vehicle wrap with custom hood & a-pillar geometric designs. 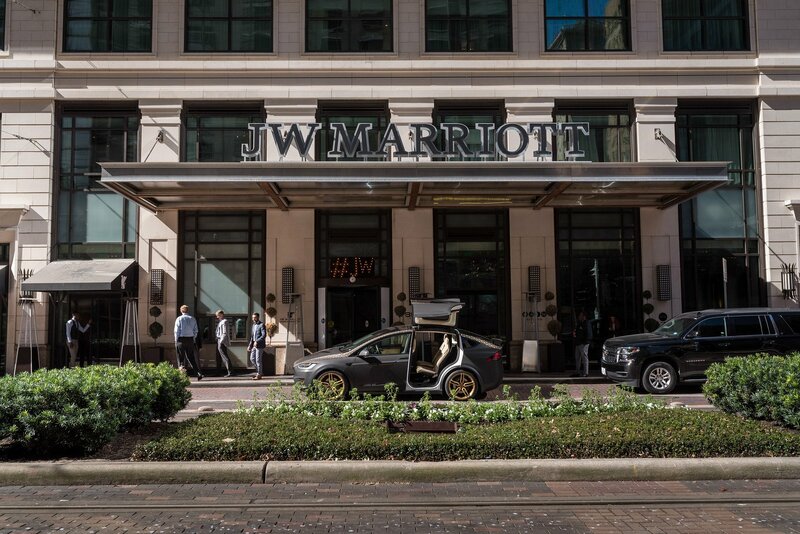 JW Marriott's logos applied on doors and hood. 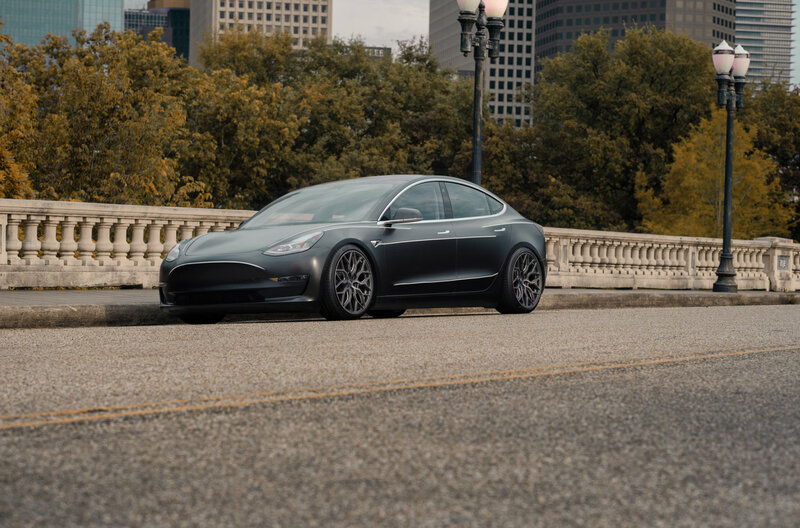 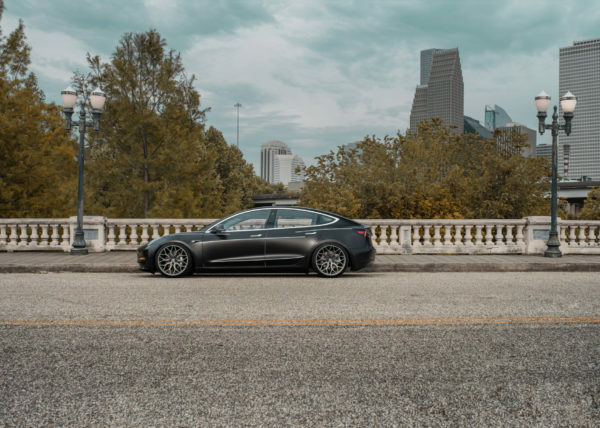 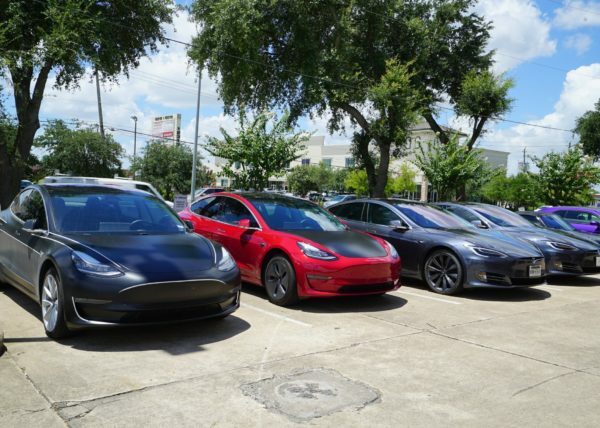 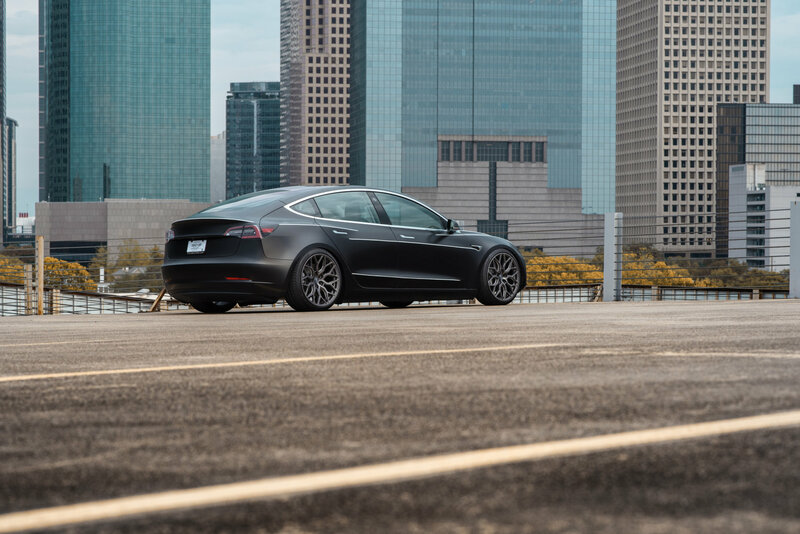 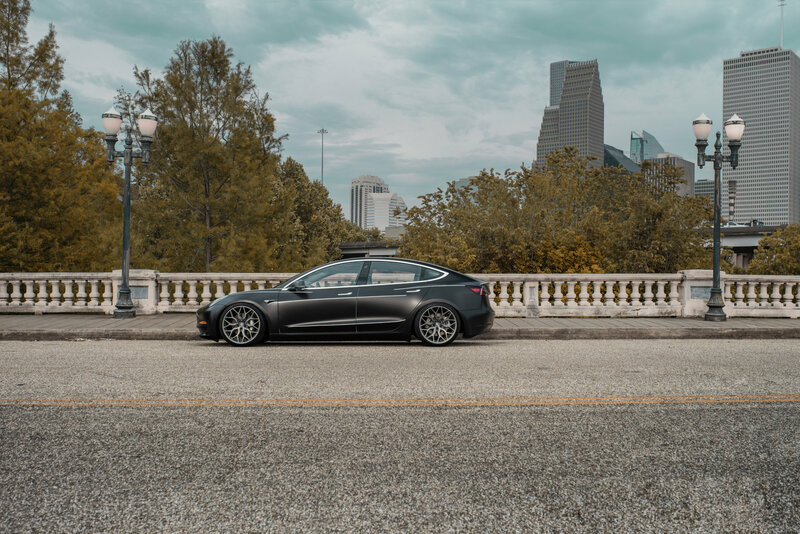 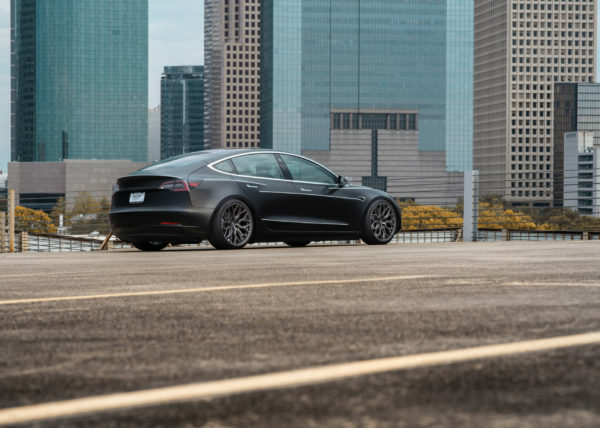 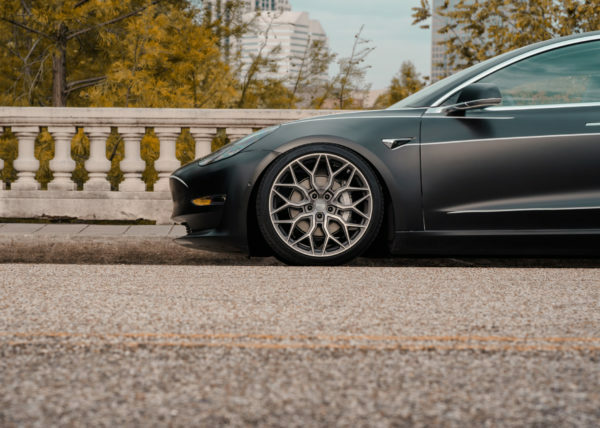 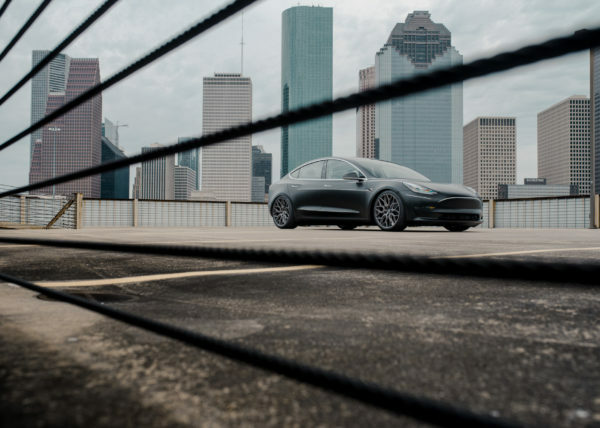 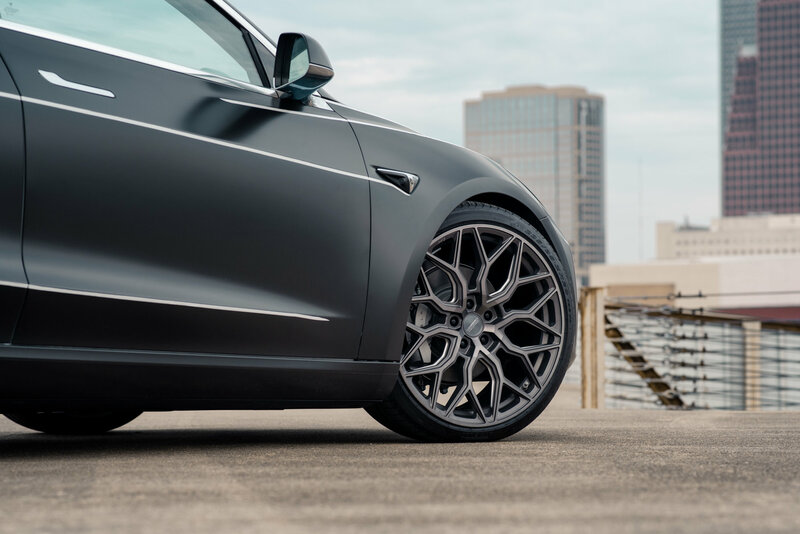 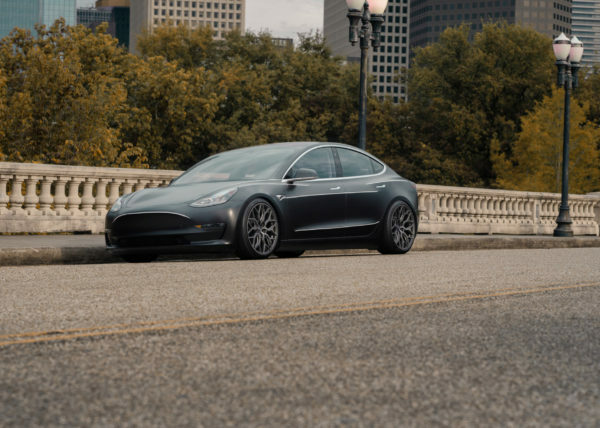 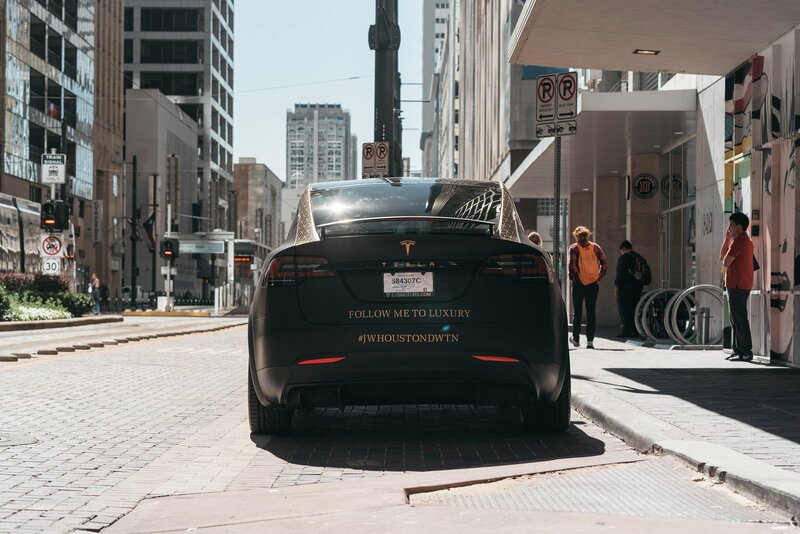 Ever since we received our first Model S when it was first released, we've been helping clients make their S, X, and 3 truly unique and their own. One of the most popular mods we offer is vinyl wrapping, and especially chrome deleting. 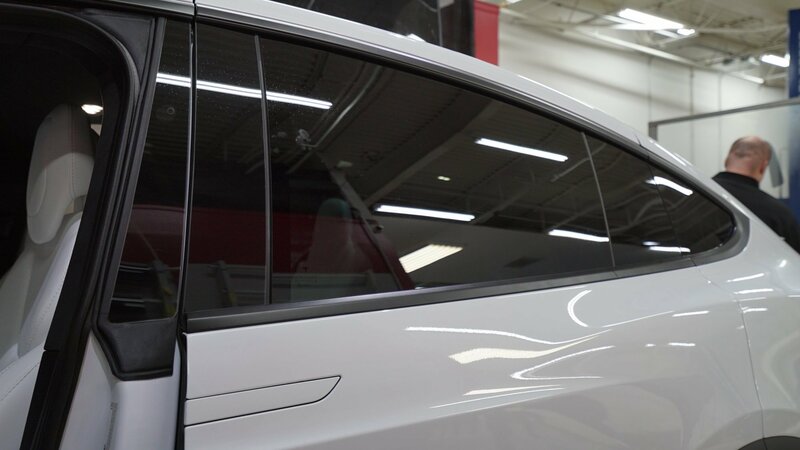 Chrome deleting is essentially "deleting" all the chrome that's on the exterior of the car and wrapping it in another color vinyl. 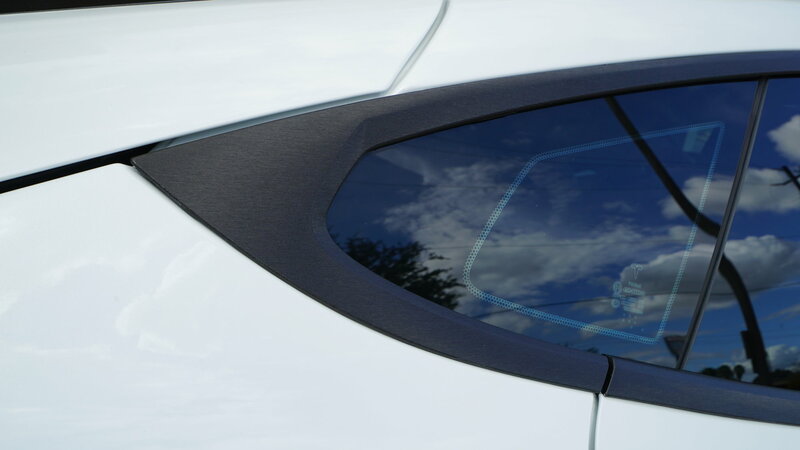 The most popular option being matte black for a sportier look! 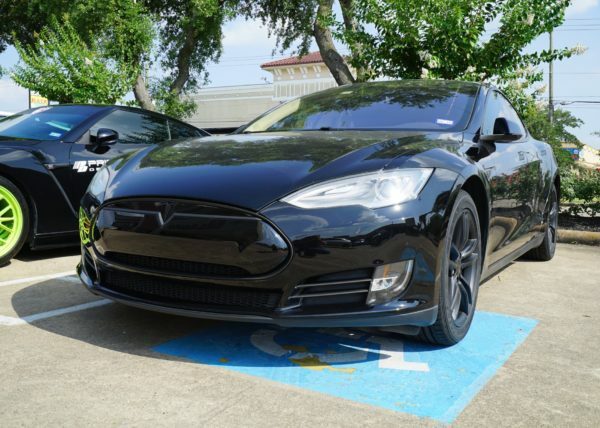 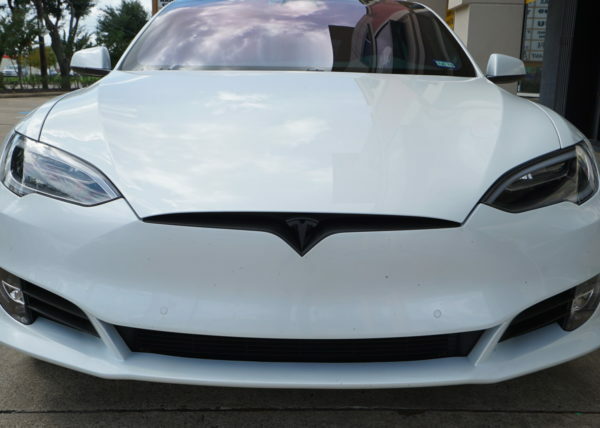 Chrome deleting is a great way to give your Tesla a sportier look. There's quite a bit of chrome on the car from the front bumper all the way to the back, and if you're looking for a more aggressive, sportier look, the chrome can take away from that. 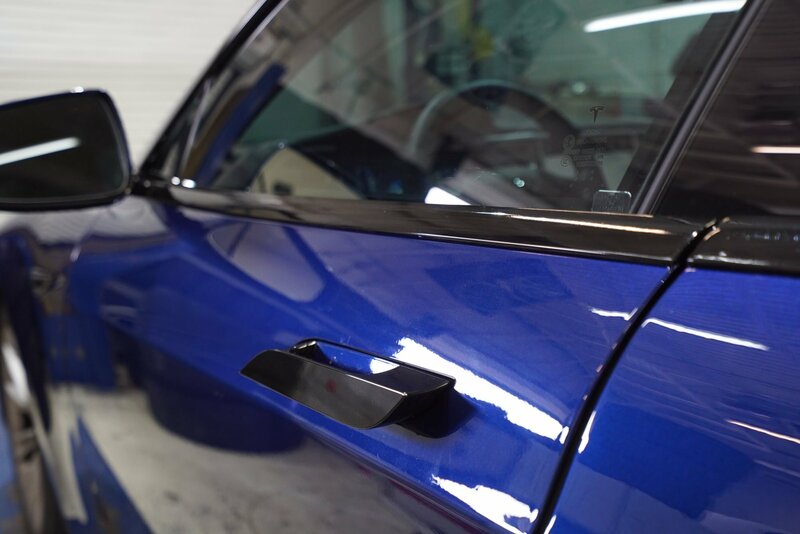 We can vinyl wrap the chrome pieces in a variety of colors to hide the chrome and to personalize it just the way you want. 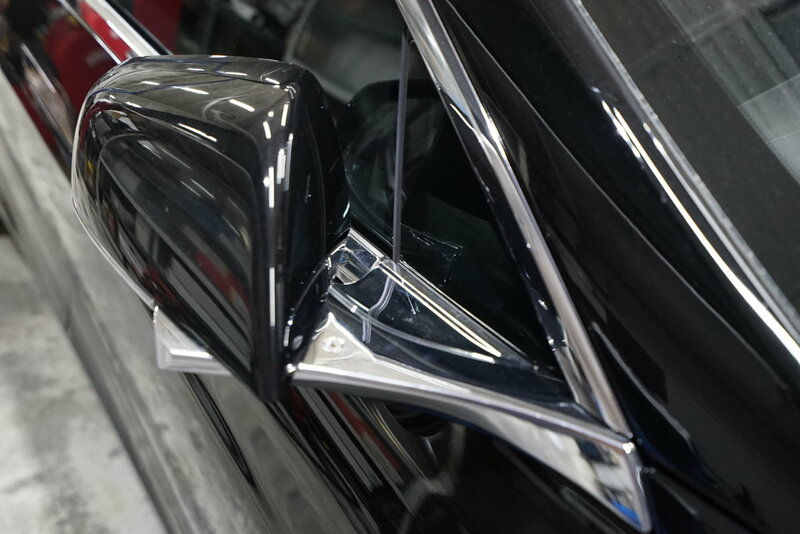 If you prefer to have your chrome pieces painted instead, contact us for more info. 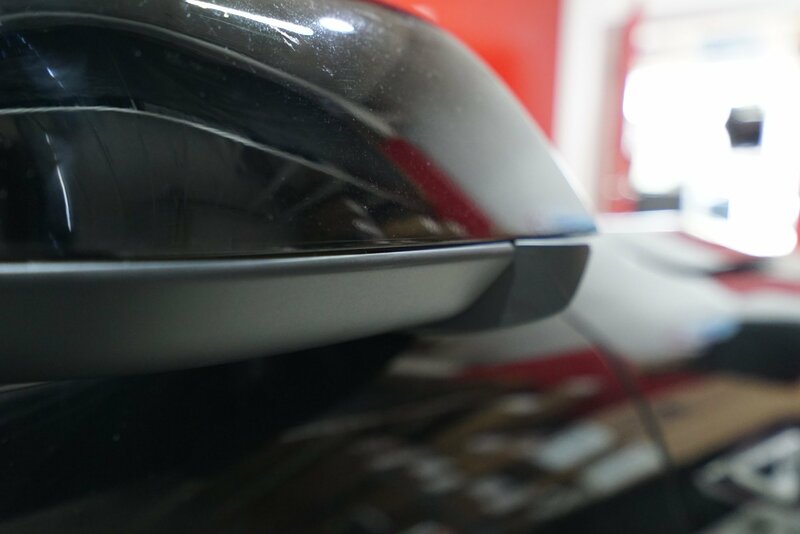 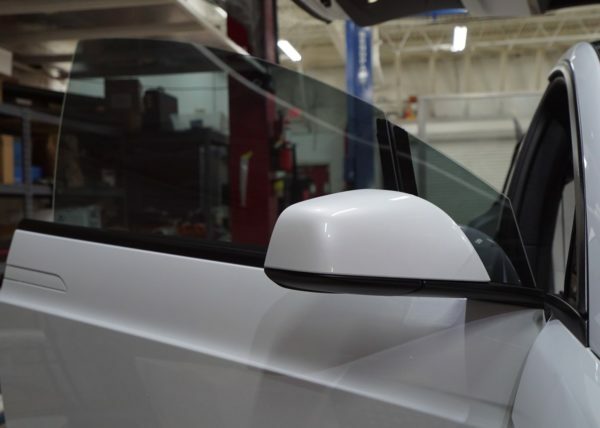 Mirror base on the Model S before the chrome delete. 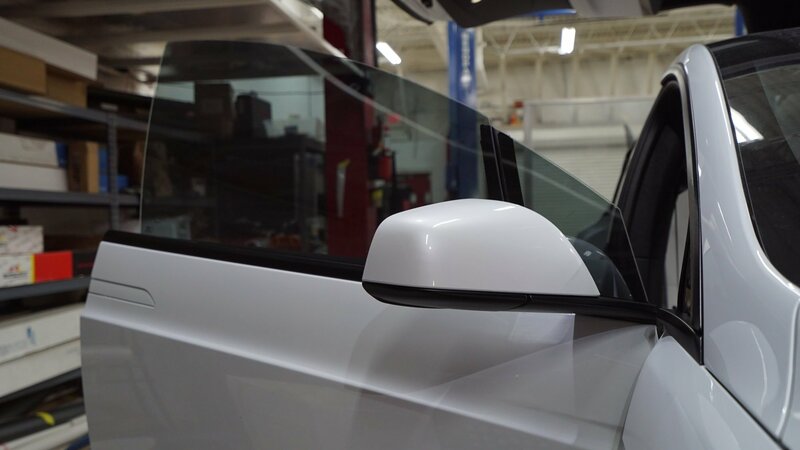 Mirror base of the Model S after chrome delete. Wrapped in matte black. 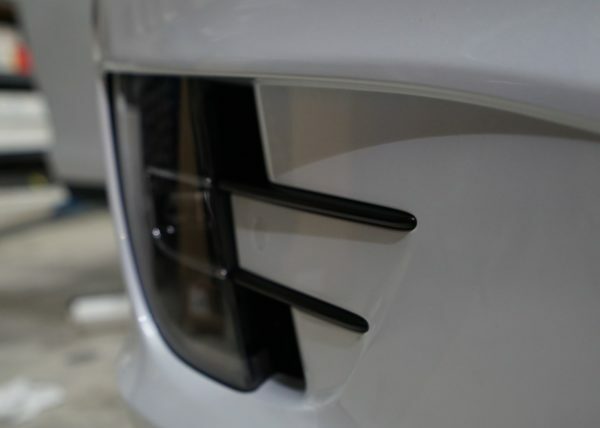 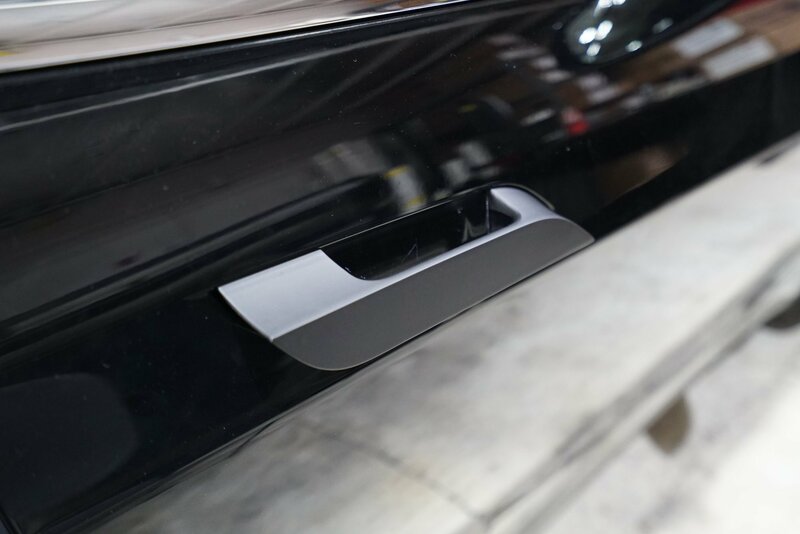 If you prefer having your chrome accents painted instead of vinyl wrapped, we offer unique services that aren't available with vinyl films, like color matched door handles for that extra clean look. 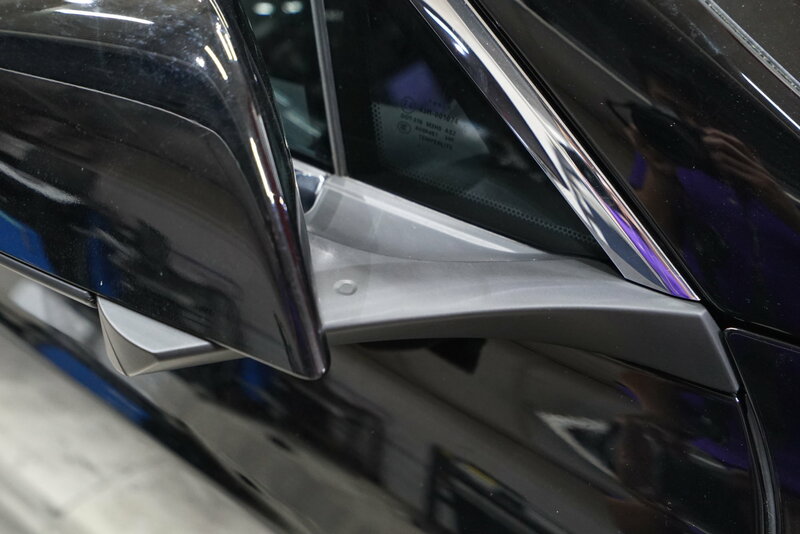 Painting your chrome accents will create a cleaner, more permanent finish than vinyl wrapping. 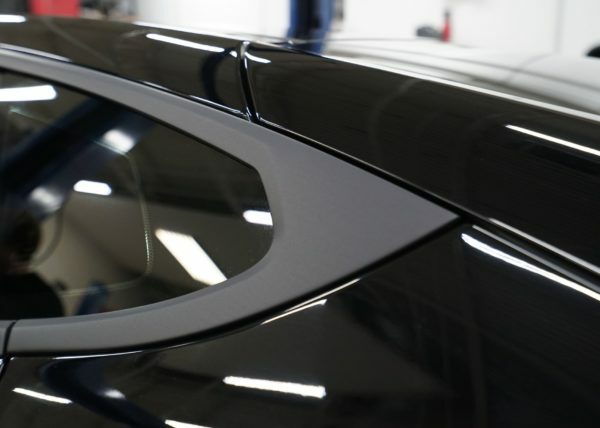 This is a great option for clients looking for a specific color that can't normally be achieved with vinyl film. 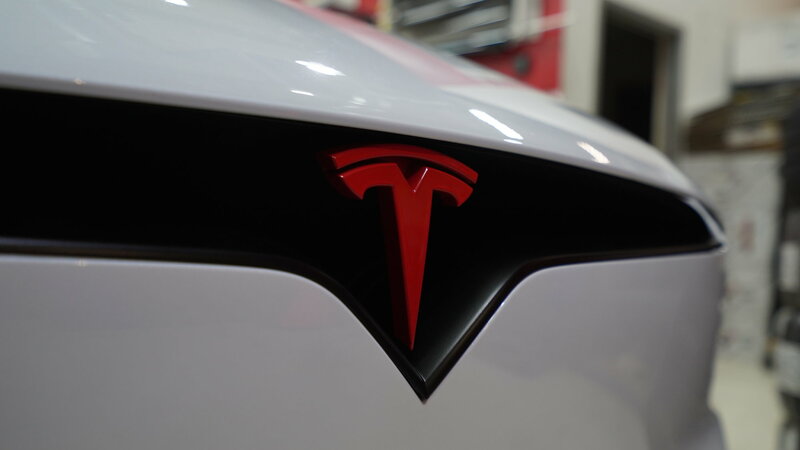 T logo painted in Gloss Racing Red. 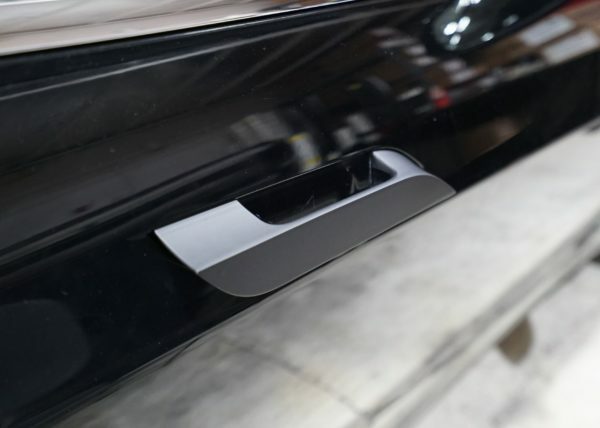 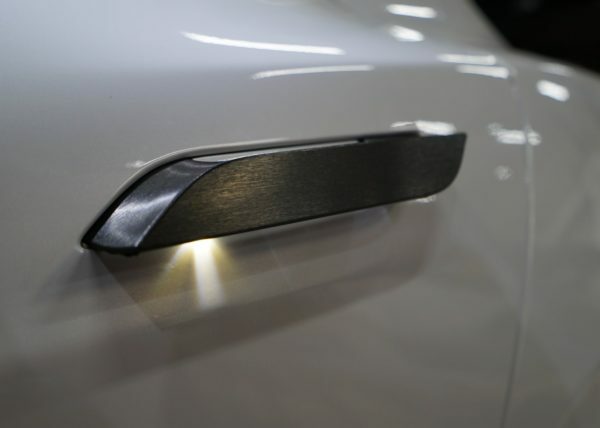 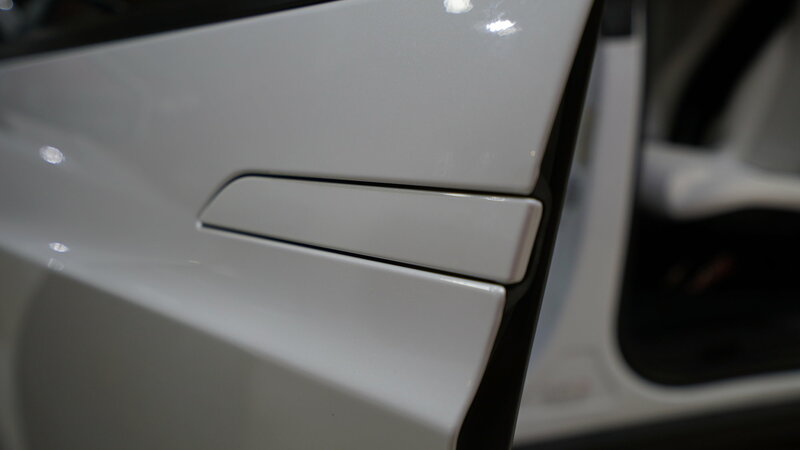 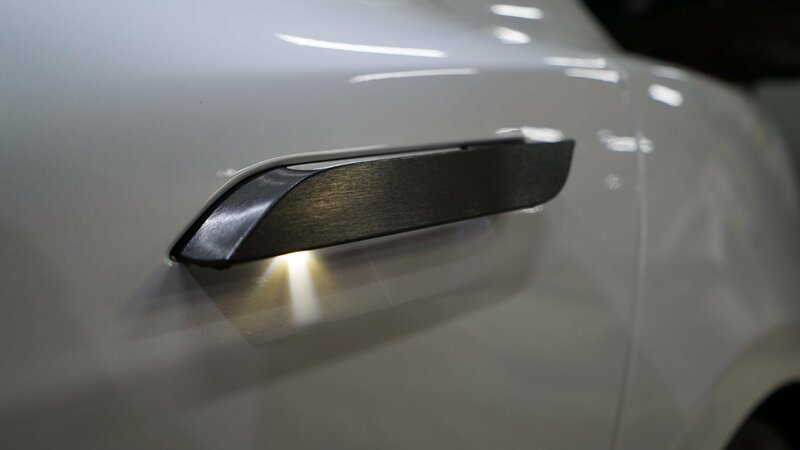 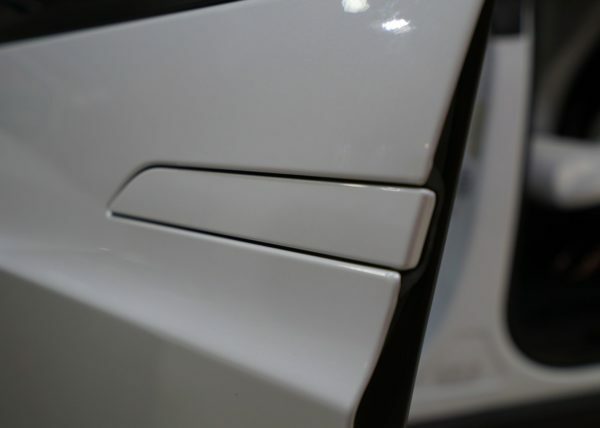 Model X door handles painted color matched to body color. 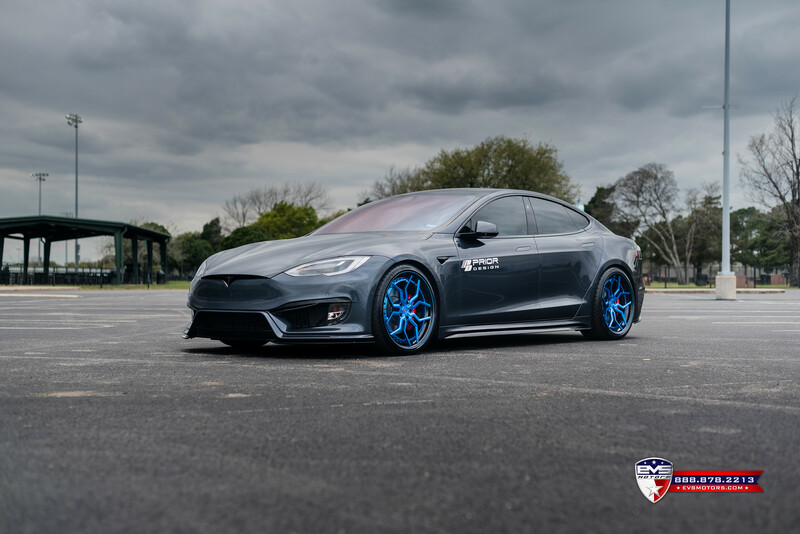 EVS Motors x Prior Design PD1000 Tesla Model S - chrome deletion mixed with carbon fiber accents on door handles and T badges. 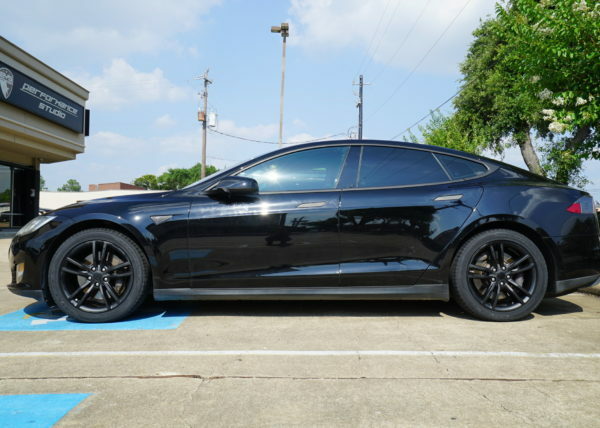 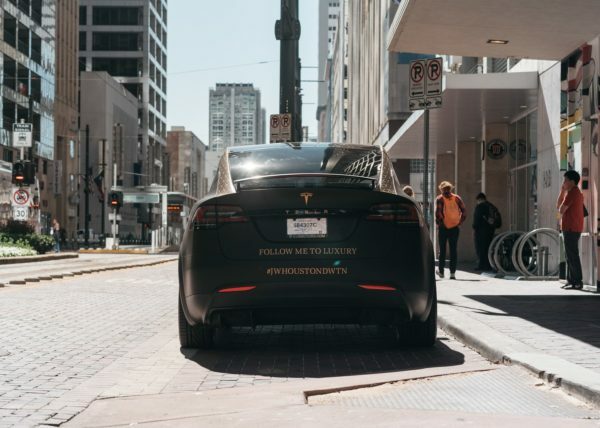 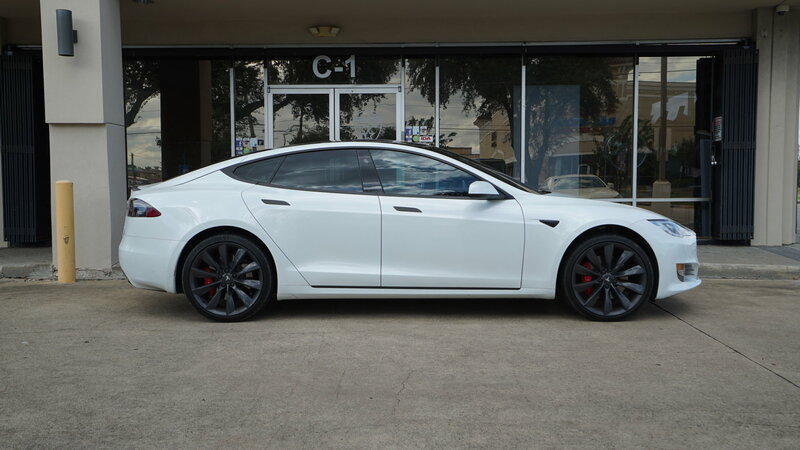 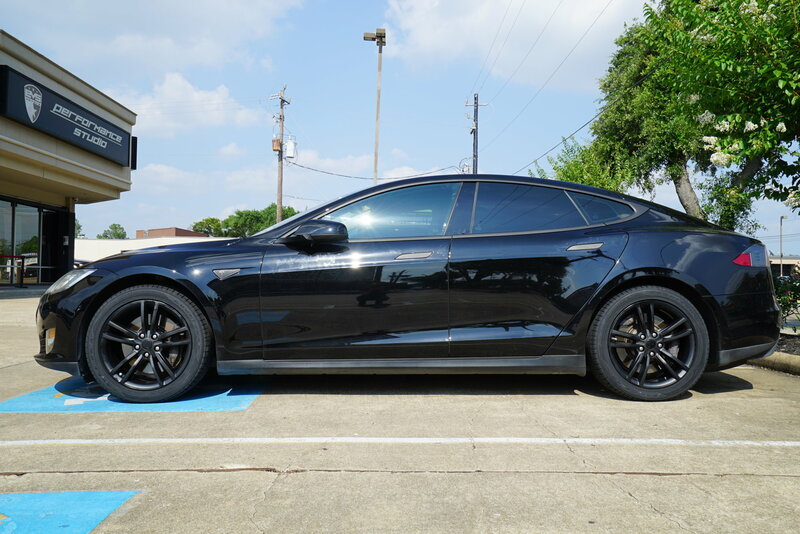 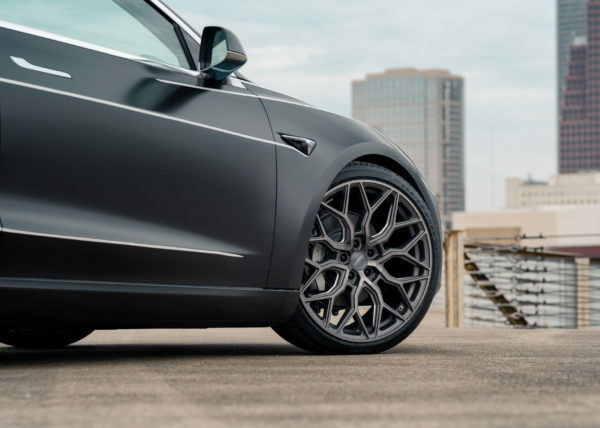 Includes T badge on bumper, chrome slit under T badge, chrome slits by fog lights, fender emblems, mirrors, door handles, window trims, door chrome strips, trunk strip, "TESLA" word, T badge on trunk. 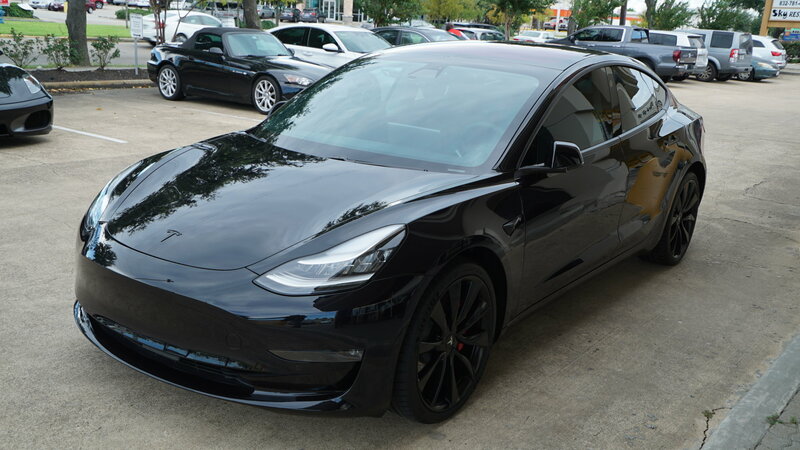 *Price is based off of standard vinyl colors. 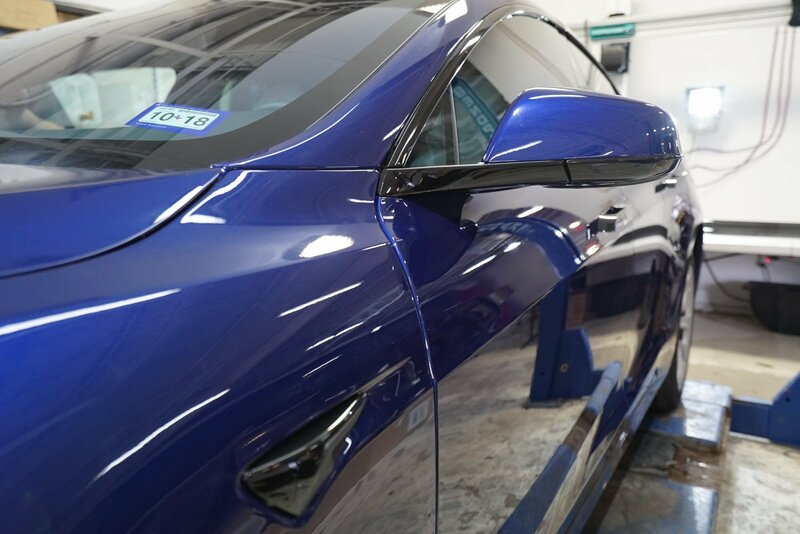 Contact us for special requests like painting. 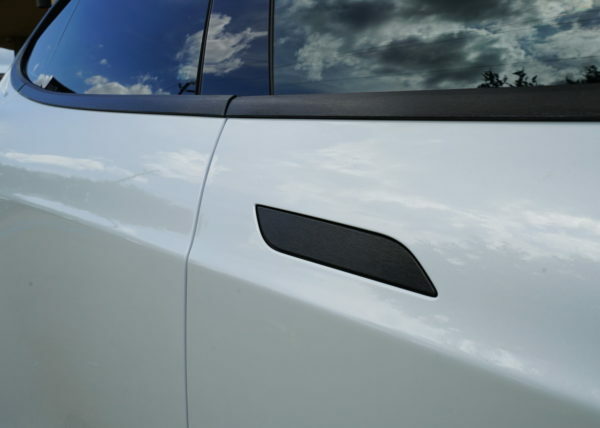 Includes fender emblems, mirrors, window trims, and door handles. 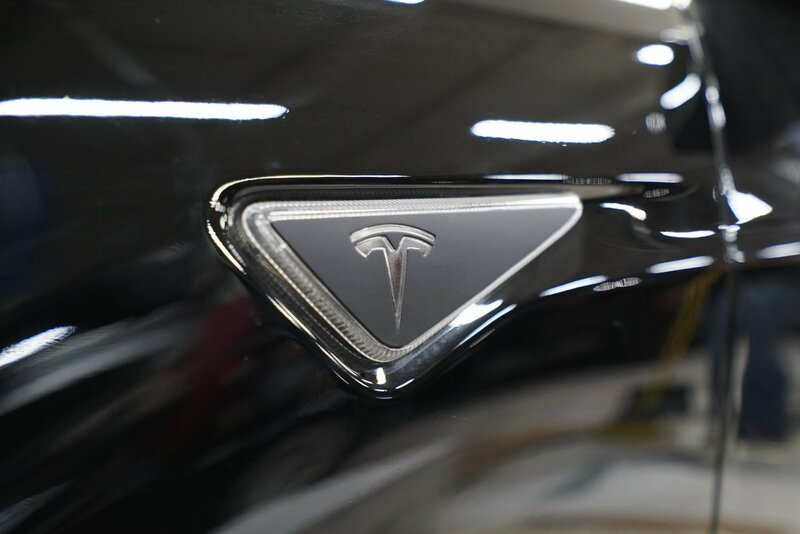 Front and rear T logos are additional. 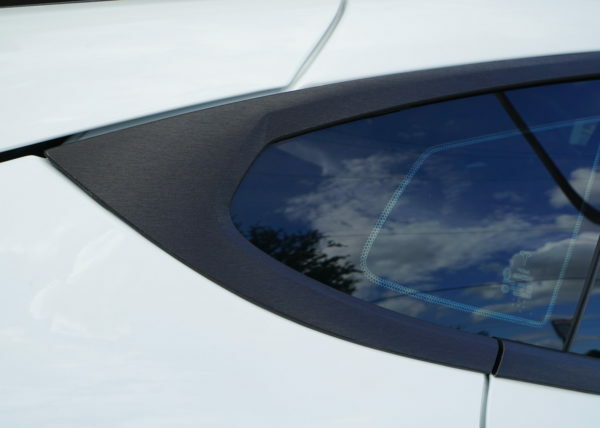 *Price is based off of standard vinyl colors. 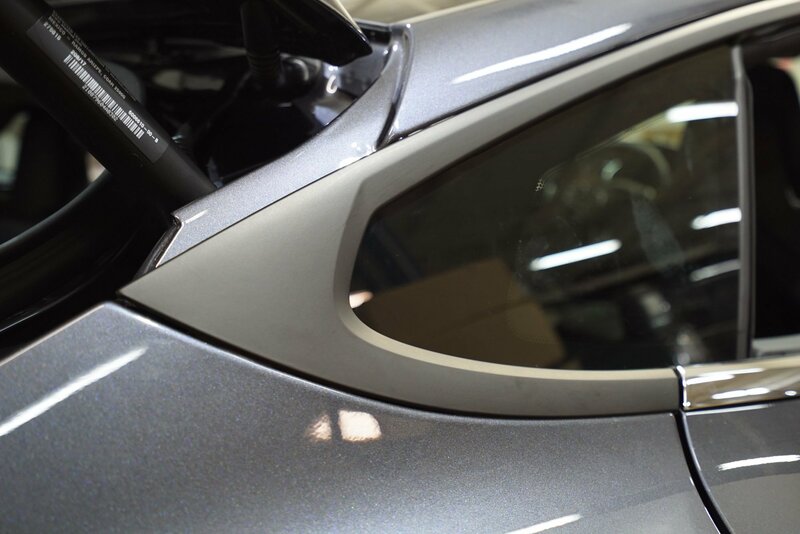 Contact us for special requests like painting. 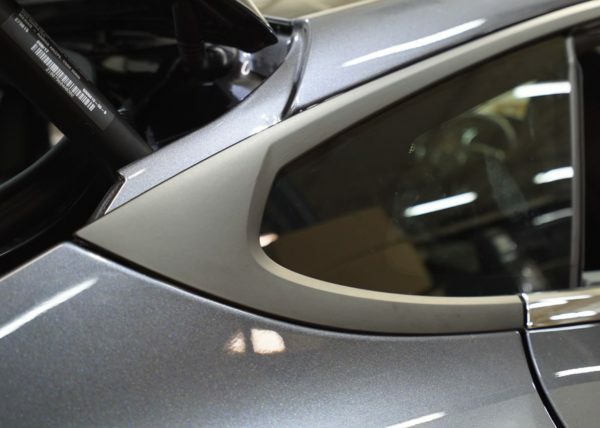 If you're looking for a complete exterior color change, we offer full vehicle wrap services. 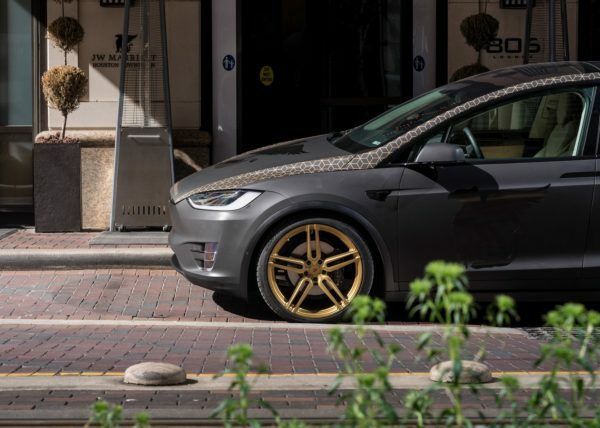 This is the perfect solution to changing up your Tesla's color to something a little more unique, and the best part is it's all reversible. 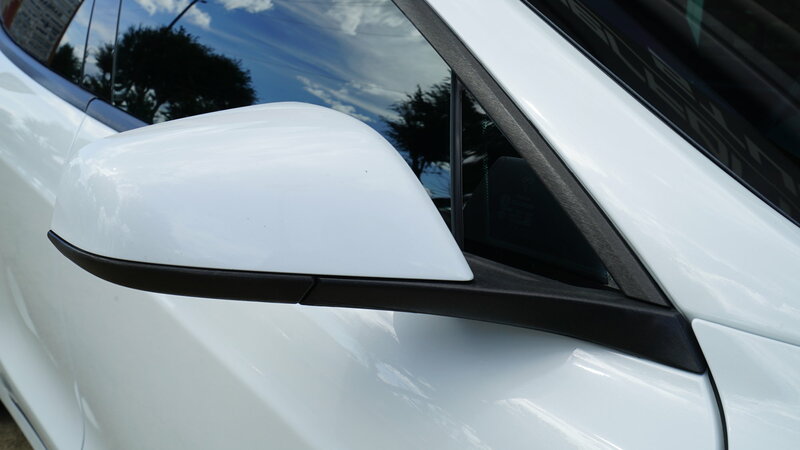 When you're ready for a new color, just peel it off and start fresh again! 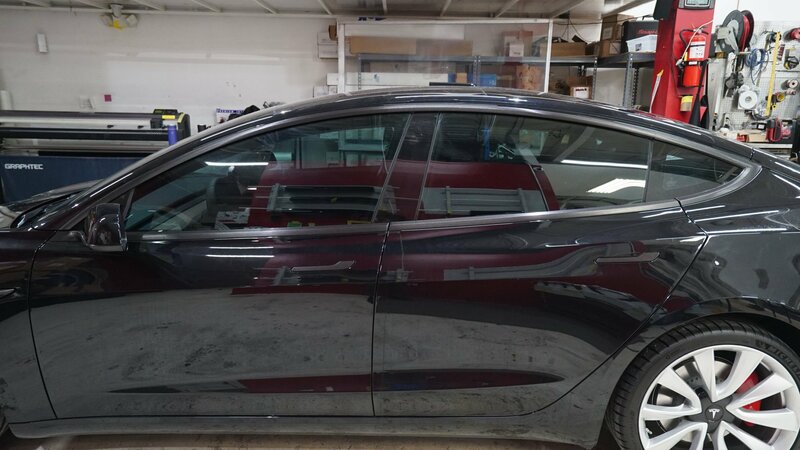 EVSgo's Model 3 rental wrapped entirely in satin black with reflective white stripes. 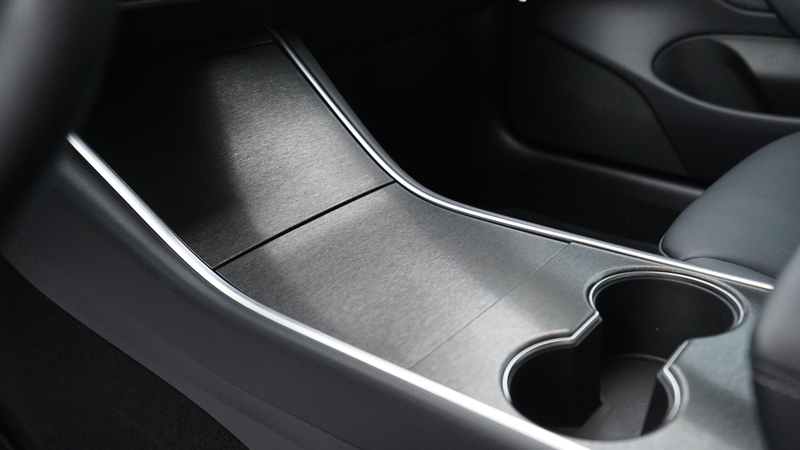 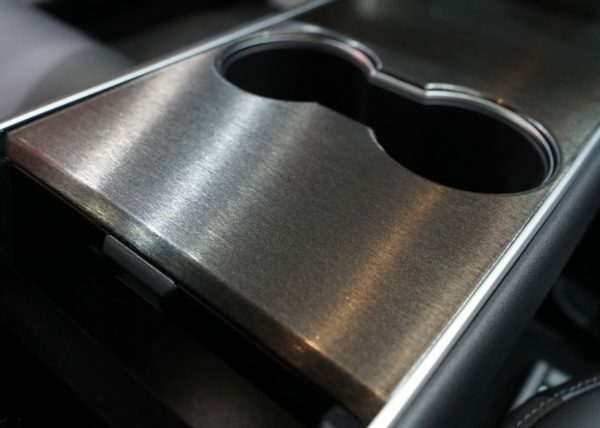 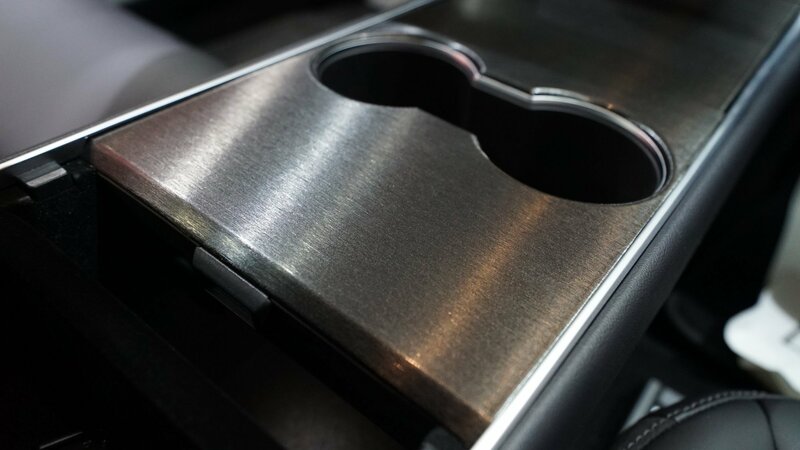 We can change the color of your center console to a different color and or even a different texture. 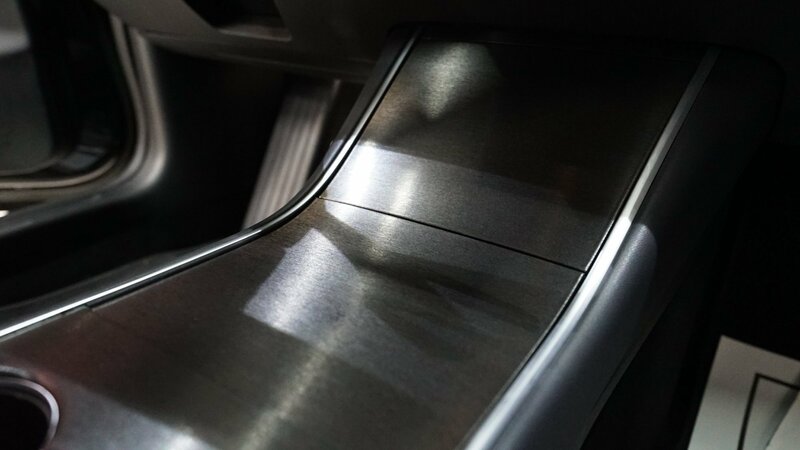 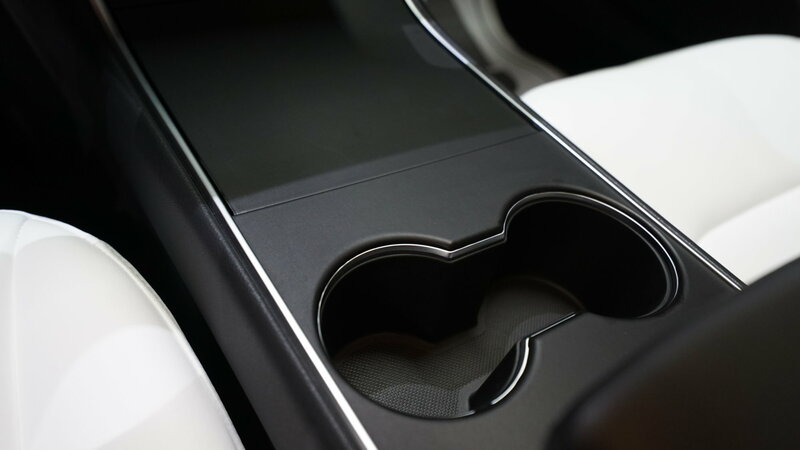 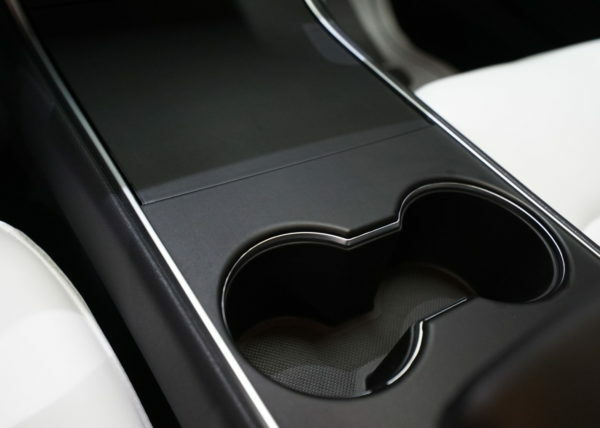 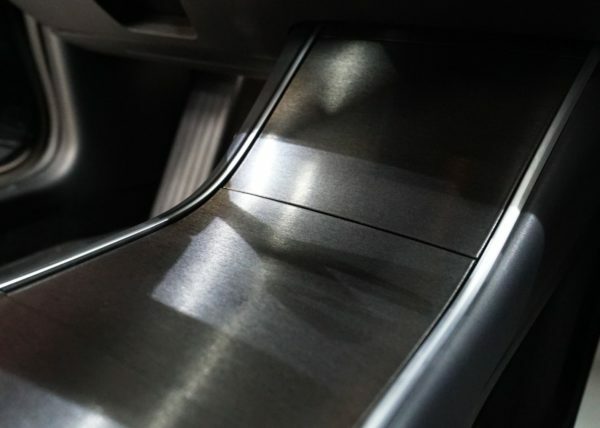 The gloss black pieces attract fingerprints and show scratches relatively easily and quickly, aging the look of the center console pieces rapidly. 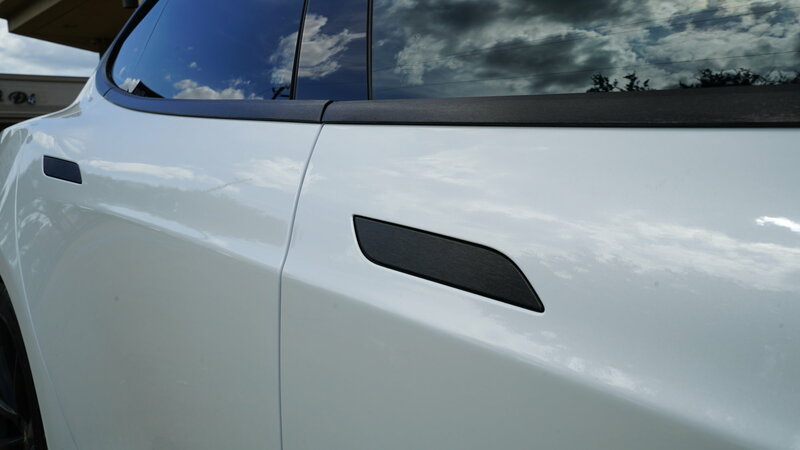 Add a touch of personalization and protection when you choose to vinyl wrap them. 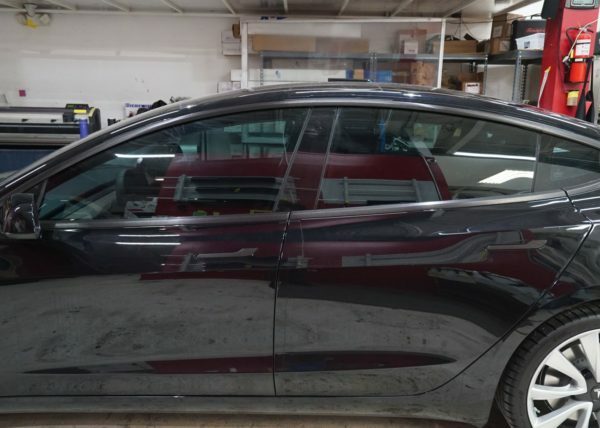 Why Vinyl Wrap instead of Paint? 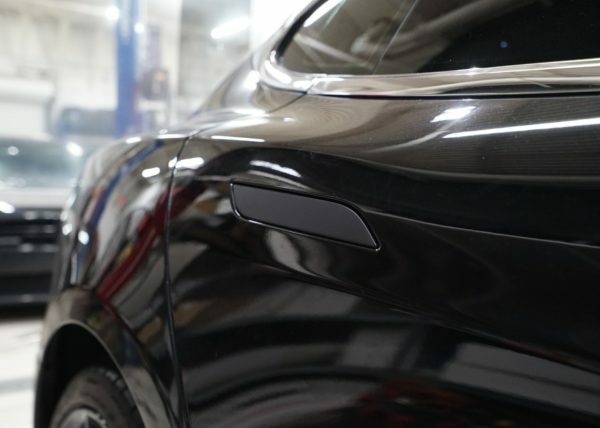 Vinyl wrap serves as a temporary color change and because of that, it's also not as much as an investment as paint which is permanent. 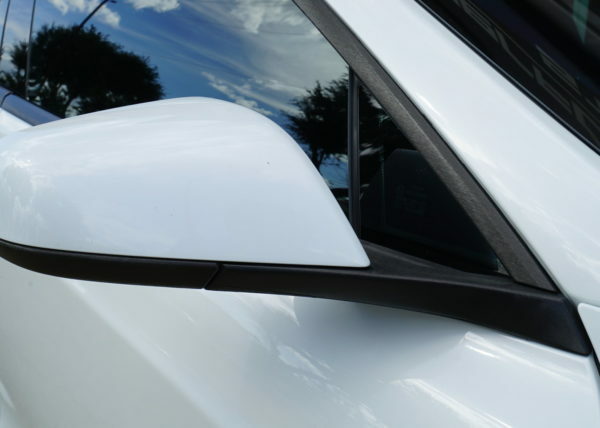 It's a great solution if you want to do something new and fresh without being a major commitment. 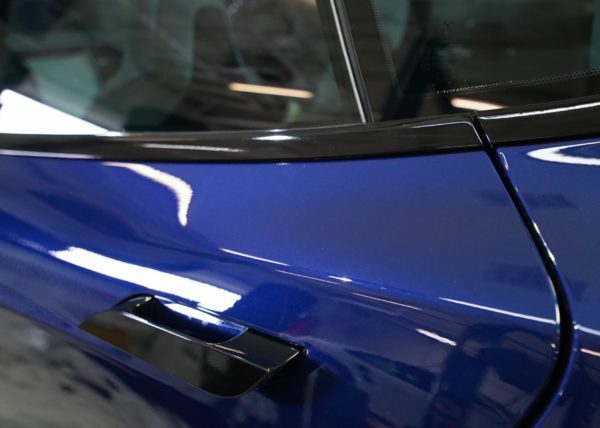 Paint does look incredibly good though, especially if you're seeking a very specific color that vinyl wrap doesn't offer, like trying to color match another paint color or doing something really custom. 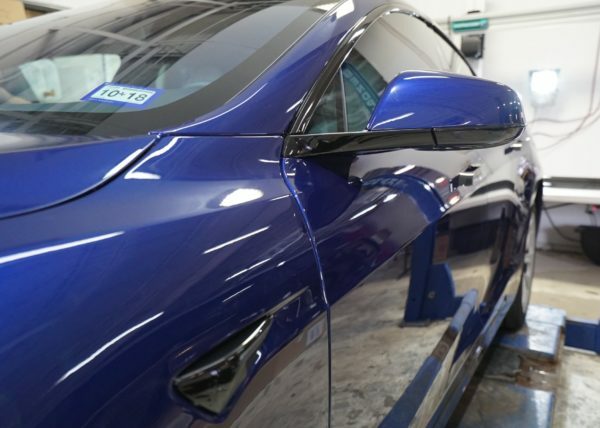 What's the Difference Between Vinyl Wrap and Clearbra/Paint Protection Wrap? 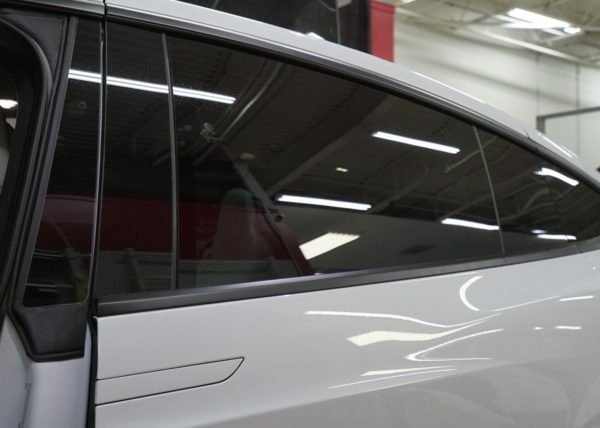 Vinyl wrapping is perfect for changing a color to something else you like, but it doesn't offer the same benefits as clearbras at all. 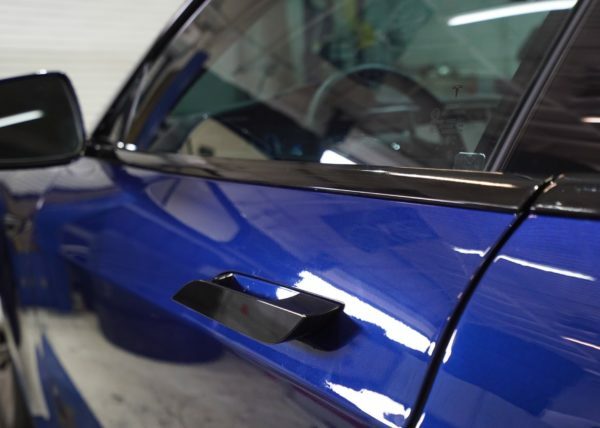 Clearbras are made to protect and show your paint, so they are "suppose" to be clear (some brands are much clearer than others). 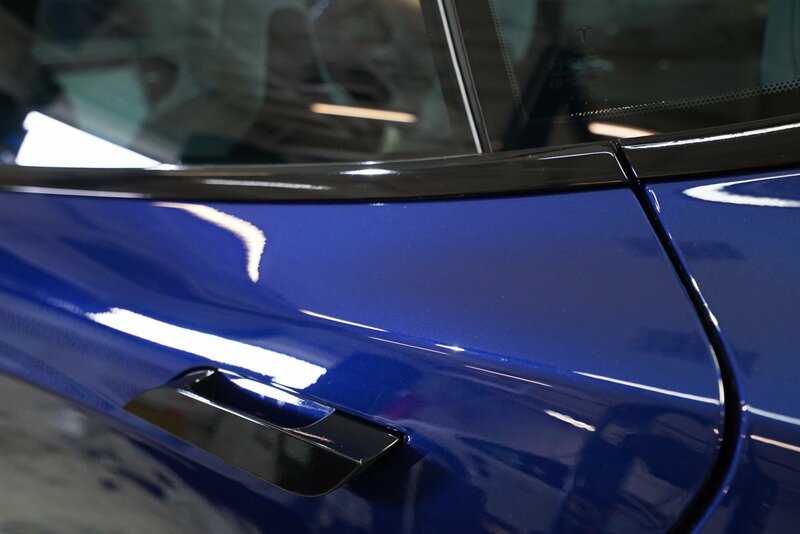 Clearbras like ClearGuard Nano do much better against rock chips than vinyl wrapping and offer unique properties like hydrophobicity (water beading), deeper gloss shine, and self-healing. 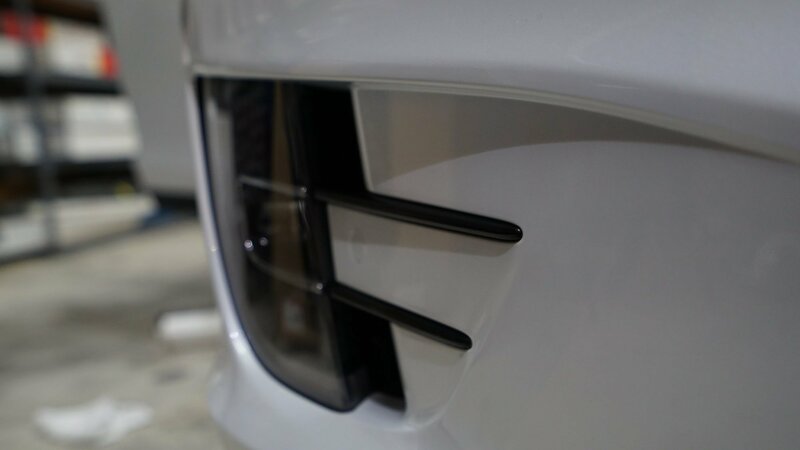 Keep in mind these differences so you know exactly what you want. 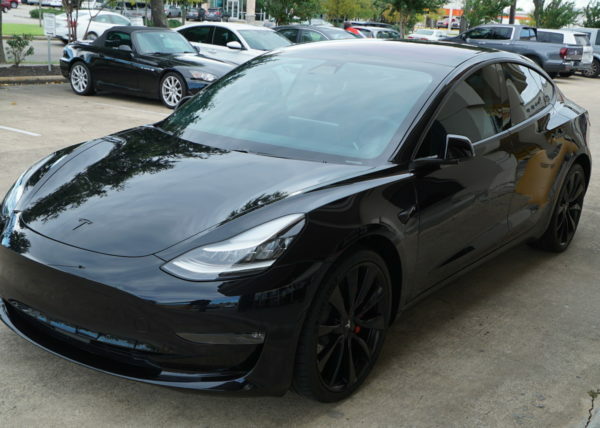 If only there was a simple answer! 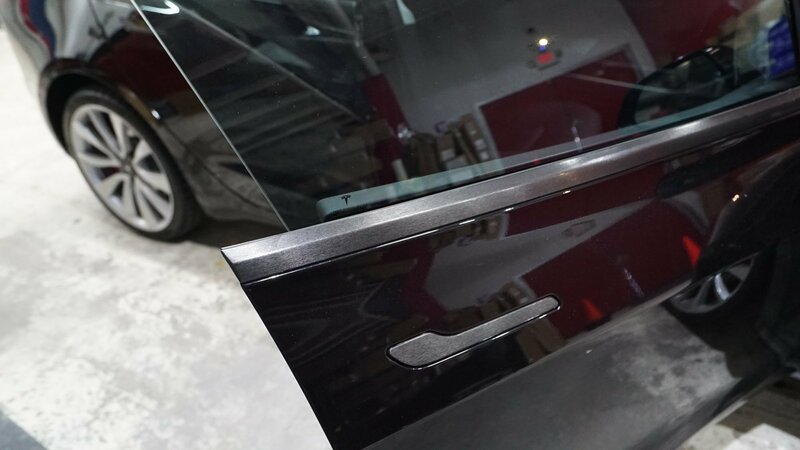 Vinyl is meant to be temporary, so one should think of it as such. 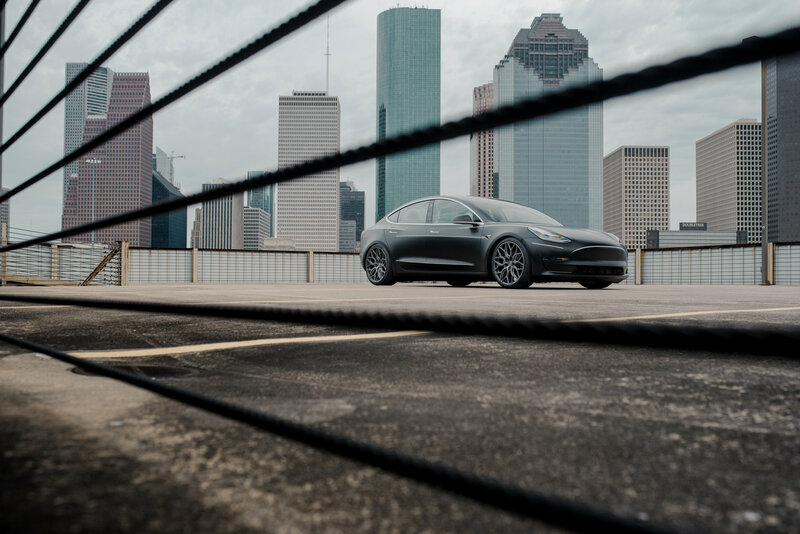 Weather and environment play a huge part in it as well. 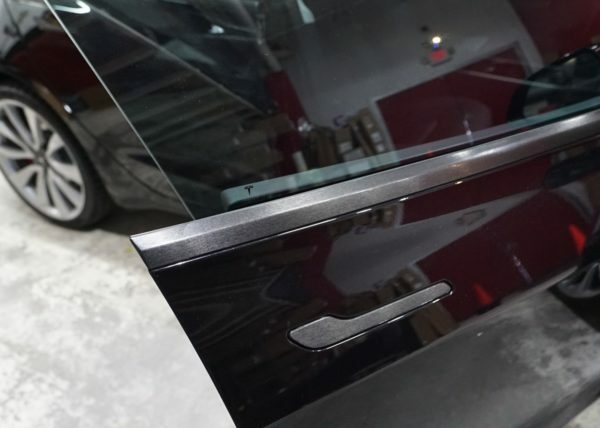 Maintenance plays a big part as well i.e. 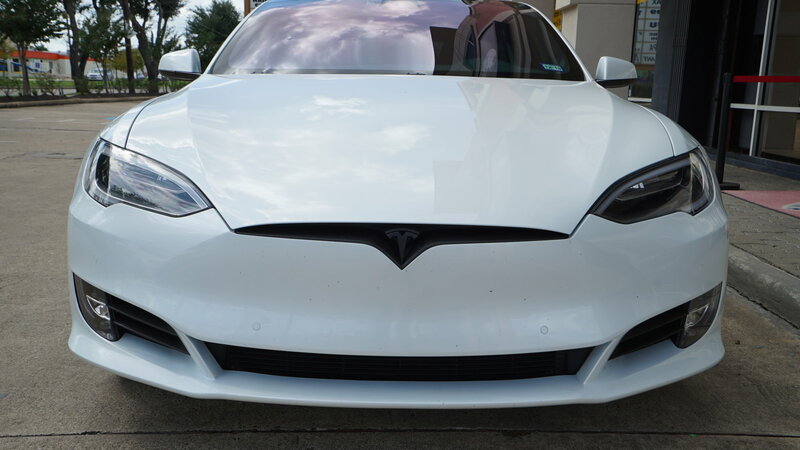 cleaning off dirt, bird poop, bugs, etc. 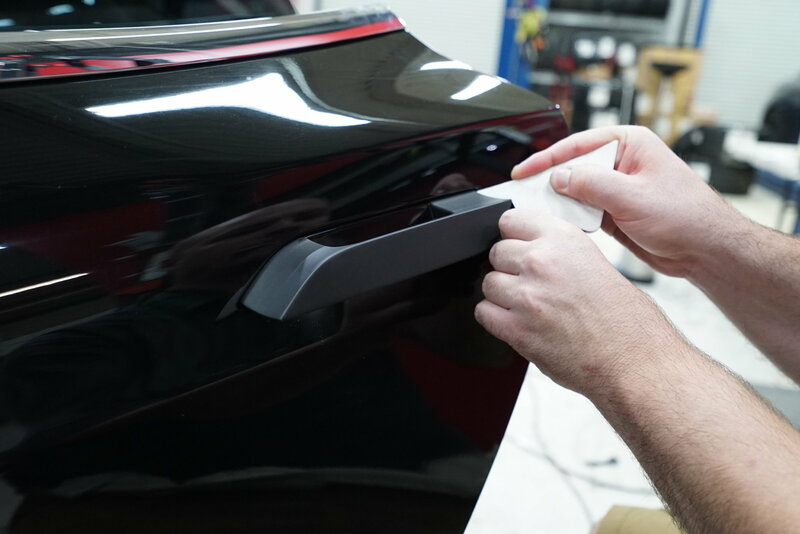 will help keep the look of the vinyl looking new a lot longer. 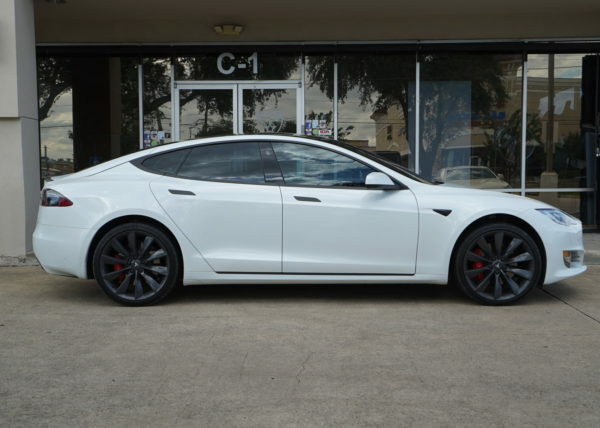 So there's too many variables to give a solid answer, but a range can be around months to years.